Q. Do your science classes reflect a belief in evolution or creation? A. Neither. I believe God is the sole creator of all things and the path to eternal salvation can only be found through his son Jesus; please review my statement of faith. Many websites and YouTube videos are available to show students how to build science projects or learn new concepts - and they do it for free. When I introduce scientific concepts to my students - I use mathematics - without evolution and without creation. My students learn how to solve problems - lots, and lots, and lots of problems! "I Want To Help You Excel!" I teach students step-by-step methods of problem solving; I clearly show all of the mathematical requirements to get from point A to point B. Students learn new skills by doing homework, quizzes, and tests. All results are published in a downloadable, printable, and confidential gradebook to provide an independent evaluation of progress. Additionally, I provide answers to specific questions your child may have understanding methods of problem solving. Q. Can you describe Mr. Science Teacher® services? A. We offer college-prep online classes and personal tutoring for homeschooled, private schooled, and public schooled students. We also offer science tutoring for homeschool parents who seek extra assistance in teaching science to their children. Q. What if I need help? 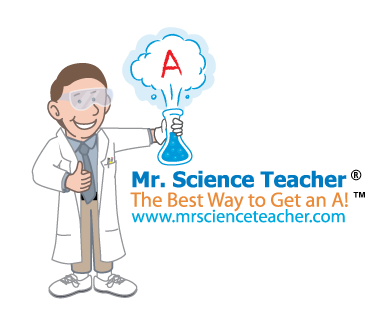 A. Mr. Science Teacher® offers Homework Help services to fit your needs; Now, Bronze, Silver and Gold. Homework Help subscription plans are available as an additional resource to help you excel! You may also obtain extra help from Mr. Science Teacher® from "Tutoring". Q. Do you offer any chemistry lab experiments? A. Yes! We offer a Chemistry Lab Kit for students to get laboratory experience. Q. Will Mr. Science Teacher® write me a letter of recommendation for college? Q. How would you describe the workload of Mr. Science Teacher® classes? A. Mr. Science Teacher® classes would be described as college prep.